We've talked about money before. Lots of times. But today, let's dig a little deeper. I'd like to talk about making a living wage as a knit & crochet designer. 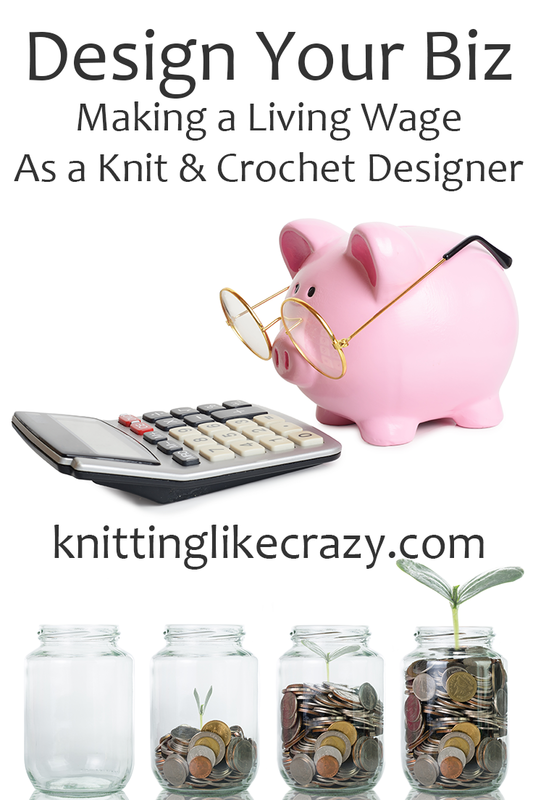 So, you want to be a knit and/or crochet designer? Great! And you want to do it full-time? Awesome! One of the first things you need to do is figure out how much money you need to make to have that happen. Remember, "if you want it you will find a way, if you don't, you'll find an excuse." I really believe that. When I finally made the decision that I wanted knitting to be my next job, I made a plan. I decided what I needed to make to quit my job. My goal: be able to earn an amount of money that I made at the lab. Not necessarily the amount that I made when I left my job (I'd been there nearly a decade and had been promoted), but I wanted to make an amount of money that I made at some point in the lab. Once I had a specific number in mind, it actually became a lot easier. I knew what I had to do. I could actually figure out how many patterns I needed to sell, or how many third-party design calls to submit to. I decided that I needed to write another book. Again, this looks different for everyone. One person might need $20,000, another might need $60,000 to be earning a living wage. You have to take a hard look at your finances to figure that out for yourself. The reality is it took two years from the day I decided I was going to quit my job one day until the day I actually left the lab for good. Obviously, I'm not really an impulsive person. :) I wanted a smooth transition not only with the workload being full-time when I stepped into my business, but also, I wanted the money to be there too. Deciding on that "magic number" is a good first step, but there's other considerations. For me, the big one was health insurance. My sweet municipal job had very affordable health insurance. When I quit, my husband was working as a consultant (i.e. no health insurance), so we had to make a plan for that too. So now, it wasn't just about paying all our normal bills, but we had to add on paying for insurance out of pocket. Yikes. And, there are sacrifices that come along with it. If I was still working at my old job, certainly I'd have a new car by now. Instead, I keep on driving my sweet Toyota Camry with 155,000 miles on it, hoping it will keep going just one more year. We've put off taking huge overseas vacations that we once talked about. The car and vacations will come with time, what's important to me now is continuing to build my business so we can have those things down the road. I hope this helps those of you considering the dive into full-time designer life. It's the hardest job I've had. But it's the most fun too. Figuring all this out can be a little overwhelming. There's lots of resources out there. I've found Tara Swiger's Pay Yourself class to be especially helpful.